Tequila Drinker’s Best Kept Secret? A Tequila this good and cheap has got to be one of the best kept secret on the planet (at least until this article). Yesterday afternoon, when I checked the ratings websites for bargain priced, decent 100% De Agave Tequila the name, Rancho Alegre, was no where to be found. I found some other brands that were rated very high and cost around $30 for a 750ml bottle. Some examples of these great value priced tequilas include names like Don Eduardo Silver, Hacienda Del Cristero, Marquez de Valencia Reposado, Oro Azul Blanco, just to name a few. With prestigious, Mexican brand names like these, it’s not hard to believe they are quality tequilas, even at a bargain price. But, if I had seen a name like this one on the list for $30.00, I’d be skeptical to say the least. That was before I knew what I know now. Armed with my top-shelf, $30-a-bottle, tequila shopping list, I stopped by my local liquor store on the way home from work. My hope was to find a good bottle of sipping tequila like the Don Eduardo and also buy a good mixer-tequila like Sauza for Margaritas, which my wife enjoys. Despite a very nice display and selection of Tequilas, I was unable to find any of the names on my wish-list. I was about to grab the $22.99, 1.75L Bottle of Sauza Gold, when the $17.99 price tag with the unusual name, Rancho Alegre, caught my eye. Underneath the Ranch Alegre label, read 100% De Agave. Now, I’ve had tequilas that claim to be 100% agave before that weren’t any good, so I was skeptical to say the least. Some of these lower priced tequilas claiming to be 100% De Agave remind me of Cuervo. They are very dirty and foul tasting, and don’t make a smooth margarita. Still, at $17.99 for a 1.75L bottle, I thought it might be worth the risk. I loaded the Safari App on my iPhone and searched for a quick review and found some very favorable comments. 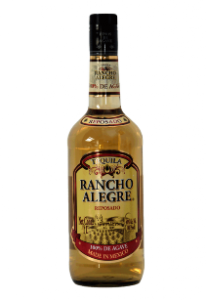 The ratings stated that Rancho Alegre is not only a good mixer, but very tasty sipping tequila. Either the Reposado or Silver Rancho came highly recommended by the first online review. Deciding I no longer needed the Sauza, I picked up a 1.75L bottle of Reposado. The first sip of Rancho Alegre lived up to and maybe even surpassed its online rating: Buttery toffee, Agave nectar finishing up with pecan and walnuts. The finish has a bit of a nutty bite, but not at all unpleasant. It was almost too good to use for Margaritas. Before mixing a batch, I let my wife take a couple of sips. She immediately approved and absolutely savored the Margaritas. I couldn’t decide if wanted to drink the Margs or sip on it all by itself, so I did both. I probably drank way too much tequila last night, but had absolutely no headache this morning. I’ve reviewed some excellent bargains in Vodkas and Gins, but this newly discovered tequila is the clear winner of them all when it comes to bargain priced liquor. Now that I’ve let the secret out of the hat, I’d better stock up on Rancho Alegre while it’s still available at such an astoundingly, low price. How do you rate Rancho Alegre Tequila?